More suited to the diehard mod freak, MVocoder requires patience and understanding to get the most from it. Very powerful. Unusual sounds possible. Lots of modulation potential. Lets you use your own synths. Higher settings guzzle CPU. Not as good for classic sounds. Not quick to set up. As the king of multiband processing, it was only a matter of time before MeldaProduction turned its attention to a plugin effect that's built on band-splitting. Say hello to MVocoder. "The vocoder was originally developed to narrow the transmission bandwidth required by the human voice"
The vocoder was originally developed to narrow the transmission bandwidth required by the human voice. The idea was to send the signal through a band-splitting filter and use envelope followers to track each band. This 'modulator' information was then applied to a carrier signal - typically a synthesised wave - generating speech characteristics. Before long, some bright spark realised you could play said synthesised wave melodically, and a studio classic was born. Anybody familiar with with the Melda family of plugins (VST/AU) will feel instantly at home. The idea with this ever-expanding range of processors is simple: take a classic studio effect and add heaps of modulation and MIDI control over four main processing groups, as well as excellent Melda staples like the Randomise option and its more subtle CTRL+Random variant. You can choose to process your audio using up to 100 analysis bands for greater accuracy, but that's not realistic in terms of CPU usage. A much better way to increase intelligibility is to concentrate on your carrier signal. This is where MVocoder parts company from most other vocoders: it has no onboard carrier - you have to supply your own via a sidechain input. While this gives you more choice than many vocoders, it does make it much more fiddly to set up. Also, the consequent latency and glitching means that unless you're using the most basic settings, you can pretty much forget about live performance. Still, a nice touch is the carrier and modulator swap button, which swaps the sidechain and main path inputs to the plugin, so if you've opened it on the wrong channel, you don't have to move everything around. This can also result in some interesting accidents. "If you really like to experiment and are a modulation freak, you won't get bored of MVocoder in a hurry"
Another problem for the newcomer is the descriptive nature of Melda's manuals. Vocoding is a bit of an art. Simple tricks like getting your vocalist to accentuate their plosives, compressing your source material before sending it to the vocoder and adding white noise for greater intelligibility are essential for optimum results, and the choice of carrier signal can have a huge impact. None of this is even touched upon in the manual, though, so you really do need to know how to get the most out of it beforehand. Don't get us wrong: the main vocoding section does feature the requisite controls, but it doesn't make using them easy. In summary, MVocoder is almost too advanced for its own good. It offers huge potential power and control at the expense of easy operation and realistic CPU usage. You get the constant sense that this is just a variation on the 'Melda M-theme' rather than a dedicated vocoder built from the ground up (despite the well designed band control GUI). It needs more tailoring to compete with some of the great (yet technically less powerful) vocoders out there. 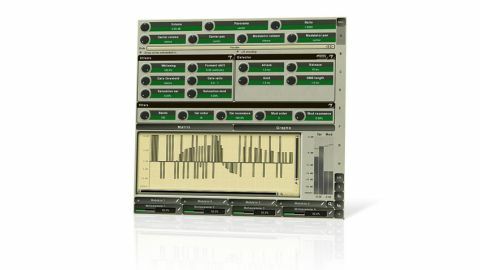 If you really like to experiment and are a modulation freak, you won't get bored of MVocoder in a hurry. If, however, you want a classic vocoder, with the trade-off being power for ease of operation, you'd be better off looking elsewhere.